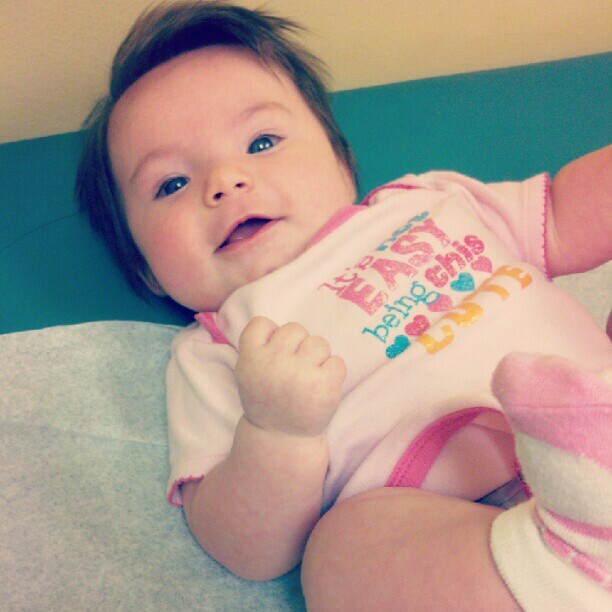 Little Olivia had her 4 month checkup today. She weighed in at 14 lbs. 6 oz. and was 24 inches long. She's short, fat, and perfect! She didn't care for the shots but she was back to her happy self again when mommy picked her up for cuddles. I have to confess. After getting back down to my pre-pregnancy weight, I haven't done much "formal" exercise. I was just so excited that I got those 31 pregnancy pounds completely off that I took a mini break which turned into how in the world do I find time to exercise with little people??? When I first started my health and fitness journey, Olivia was only 6 weeks old. She slept a lot so I could easily sneak in a workout while she was sleeping and Julianna was playing independently. Those occasions are super rare now and I fear waking anyone up during a nap! I'm sure all mommas understand. But I have been super active. Everyday we go do something. Park or zoo or just walking in the neighborhood. I've still been eating very healthy with a slurge here and there. Despite the late of time with Jillian Michaels, guess what?! I've lost 2 more lbs. I'm 3 lbs. from my 2nd goal weight!